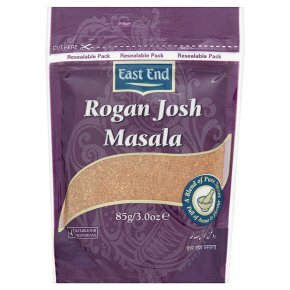 Recipe Suggestion to make delicious Lamb Rogan Josh (Serves 3-4) Heat half jar of Nishaan Curry Base, 1 tsp Nishaan Minced Garlic and 1tsp Nishaan Minced Ginger and cook for 3 minutes on high heat. Add 500 gm of boneless lamb and cook on high heat for 5 minutes, stirring continuously. Reduce to low heat and cover the pot. Add water if the sauce tends to stick to the base. Stir occasionally and cook till the lamb is tender. Add 200 gm of East End chopped tomatoes and stir. Add 2 tsp of Rogan Josh Masala mix and cook till tomatoes form a fine sauce with the curry base. Lower the heat and slowly add 50 ml of beaten yoghurt. Cook on medium heat for 10 minutes. Garnish with fresh coriander leaves. Serve on a bed of East End Basmati Rice, Nishaan Naans or Nishaan Plain Rotis.